Contact lenses need to feel comfortable on your eye. You really shouldn’t even be aware that they are there. However, there are a number of issues that can arise that will affect how well your contacts feel. For example, gritty eyes, red eyes, dry eyes, or simply feeling the contact lens can all be quite bothersome. Gritty eyes: This is generally caused by protein build-up on the contact lens from excessive tear production in the eye. People with this issue often need to use a stronger type of lens cleaning solution, such as those that are peroxide based. Also, adjusting your diet affects the actual chemical composition of your tears, i.e. you may have deficiencies in important eye oils that your tears are overcompensating for. Red eyes: This is often caused by a lack of Oxygen in the eye. You may need to change to contact lenses that use a more permeable material, so the Oxygen can get through to the eye and keep it healthy. Also, protein deposits caused by excessive use can cause the eye to want to reject the lens, thus making the eye red. Sometimes your eyes may not even hurt, but you’ll still have the issue to contend with. Feeling the contact lens: Miscalculated lens sizing or shape, excessive use, or too much rubbing on the lens can cause your eyes to become overly sensitive. The first step to undertake is removal of the contact lens altogether. There is obviously stress in the eyes, so this will give them a better chance of recovering quickly. The longer you leave the lenses in your eyes, the more time it will take for them to return to normal health. Dry eyes: Sometimes you may feel like your contacts are sticking to your eyes. This is a sign that the eye has become too dry, and if this occurs, the health of your eyes decreases. Your eyes need to stay healthy; the contact lens needs to be right for you. Tears are made up of an oil component, a water component, and a delivery system. Taking nutritional supplements that help produce tears like Thera Tears Nutrition with Omega-3 can effectively counteract dry eyes. You can also use eye drops. There are many brands at the local chemist, but we swear on Thera Tears, both liquid and gel, as we’ve done extensive testing in an attempt to find the best solutions for our patients. 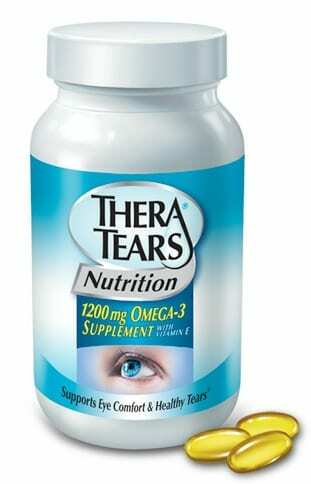 Thera Tears with Omega 3. Visual Q Eyecare swears by it. What makes Thera Tears better from its competitors is the active ingredient that both protects and stabilises your current tear film on the eye. It also promotes more tear production. The winning sign for us is when after blinking your eye the film does not dissipate quickly. The gel version is good for night use before you go to bed, as it lasts longer on the eyes. We sell this product because we want our customers to know it will be effective. 5 Responses to How Does Your Contact Lens Feel?